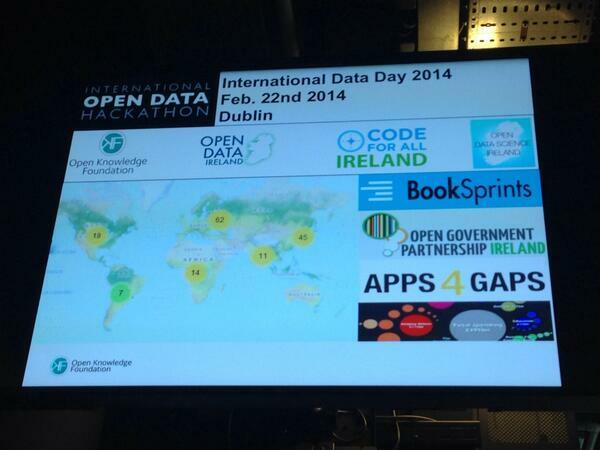 In Ireland Open Data Day was celebrated on February 22nd 2014 in Dublin with work on 4 open data and civic projects. Around 70 people – data wranglers, coders, activists, civil society representatives and interested citizens – volunteered their time and participated actively in the different projects. 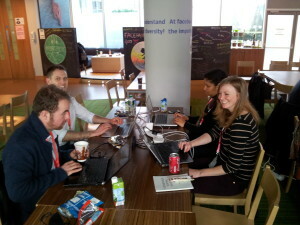 The event took place from 10am – 7pm so we got a lot of work done even with great food for lunch and dinner in between! What is Open Data Day? What did you work on? Volunteers worked on a couple of pre-defined projects but also had a chance to work on new projects pitched on the day. The beauty of those events is that you are putting anyone with an idea or a particular problem together into a room with someone or a group of people who can help you and others solve this problem with the expertise and technology we have available today. You’re essentially able to build teams around projects and co-create solutions. The creation of a set of civic apps. Did you make any progress? What are your achievements and what are the outcomes of this type of event? Yeah, sure – we are actually quite impressed with the progress we made in the respective teams. It really shows what you can make happen when you bring people together. Sure we may not always have a finished product at the end of the day but the most important thing is to bring people together, start collaborating and establish a team over the course of the day. The web allows many of the involved and interested to continue work remotely. The book sprint brought together a group of people, including a number of teachers to contribute to an open license textbook on programming for inclusion as a junior cycle optional short course as announced by Minister Ruairi Quinn last year. As an open source book it will be a free of charge teaching resource to all kids and schools in Ireland. Being free of charge parents, students, and anyone else can also benefit and get started with coding following a structured curriculum at their own time. Saturday’s book sprint sparked intense collaboration with participants becoming readers, writers, editors and publishers for a day and they have formed a team that will continue to finish the book working remotely. So far the team have added content to 4 chapters of the final textbook which are laid out to contain all resources a textbook normally needs to be accepted into schools: curriculum, teacher guide and lesson materials. Once all content has been collated the open source software Booktype will help the team to upload the chapters and produce the textbook. We made a lot of headway on Saturday and appreciate that teachers lent their expertise to create something valuable that will be available and will address the growing need to teach our kids computer programming and digital literacy. Elon Musk – business magnate, investor and inventor – founder of SpaceX and Paypal and CEO of Tesla Motors attended Web Summit 2013 in Dublin last year and reiterated that in order to compete, Ireland needs to make sure to build and retain innovative talent on it’s shores. Let’s do just that. This requires a good bit of background on this topic first: In 2013 Ireland committed to signing up as a full member to the Open Government Partnership. By participating in the OGP governments are asked to commit to an open data strategy, share information about their activities openly, increase the level of participation citizens can have in decision-making, and to use new technologies in an effort to make public data more openly available as a means of transparency and accountability. To become a full member and demonstrate commitment Ireland will need to co-create an OGP Action Plan with civil society and attempt to deliver on the commitments it outlines within a 2 year time-frame. Members of OKF Ireland have originally pushed the government commit to sign up to the OGP, have been part of the public consultations in 2013 and are now participating in a joint working group with representatives from the Department of Public Expenditure and Reform that is set to co-create this action plan. The Draft Plan is to be presented at the European Open Government Partnership (OGP) conference held on May 8th & 9th at Dublin Castle. We believe that civil society and citizens now have an opportunity to shape that action plan and so we build it out as a project for citizens to participate on Saturday. And so here is the progress we made on Saturday, and we really have to thank the interested citizens that just came in on the day, lent their expertise and are now part of a project team for making it work so well! We established a Project Team sourced from volunteers that attended this project group. So now we can continue work remotely with a couple of doughnut and coffee meet-ups in between – this is great stuff! We developed a framework for analysis of the evolving draft national action plan. The framework is based on learning from other best in class OGP Action Plans both in terms of what needs to happen to really open up data and government and how it can be achieved. The framework will allow us to assess the current Irish draft and inform the joint working group, the representatives of the Government Reform unit and the wider civil society on how the Irish plan compares to what is recommended by the OGP and what is working internationally. And we created a template – compared a set of best practice OGP Action Plans and developed a template that can be used to formulate commitments for the Irish Action Plan. Template will make sure that commitments are concrete, measurable, achievable and include important milestones. Will help us understand what success looks like. And lastly we hooked up with our friends from Open Data Science Ireland (ODSI) to continue work on a pretty awesome open data audit project for Ireland. One of the goals of OKF Ireland is to create visualizations and publish analyses using open public data to show support for and encourage the adoption open data policies by the world’s local, regional and national governments. At Saturday’s event we partnered up with members of Open Data Science Ireland a nd continued work on a data audit that was started by members of Open Data Ireland and Open Knowledge Foundation Ireland last year. This is now the most extensive list of open data sources related to Ireland with 29 APIs, 16 catalogs, and roughly 160 data sets. We were able to collect and add more information about the data sets to increase understanding of what data is available, what the quality of that data is and most importantly which type of public data is missing. 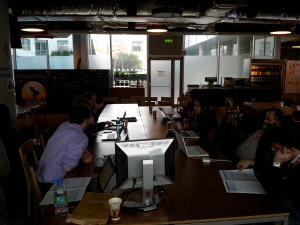 Members of the ODSI have also been able to identify a number of good example data sets that can be used for a project with OKF Ireland to analyse and showcase to citizen what type of information can be extracted from the data is available and how it can help them make better informed decisions in their day to day lives. Finally there were teams who attended the last Code for all Ireland meet-up in January and they joined and recruited volunteers for the development of some awesome civic apps. There were some really good ideas out there and teams continued work on realizing those ideas vigorously! It’s great to see these apps develop over time and people putting in the effort to really make something out of an idea. One of the Apps maps the locations of defibrillators across the country and also map locations and contact details of those trained to use the equipment – if someone had a heart attack anywhere near you – would you know where to find the nearest defibrillator? We think this has a lot of potential and the great thing is that the team is going to crowd source the locations of the defibrillators with a competition where people send in selfies next to a defibrillator. A second App would list current queuing times at local public service customer service locations (eg motor tax office, passport office etc and therefore facilitate an informed choice for customers seeking to use these services. E.g. if the App says there’s an hour wait at your local motor tax office either wait till later of go elsewhere for a coffee! Finally there was a pitch to transforms successful decision making software used by Dublin City Council last into an app that can be used by anyone and help make majority decisions in an instant. 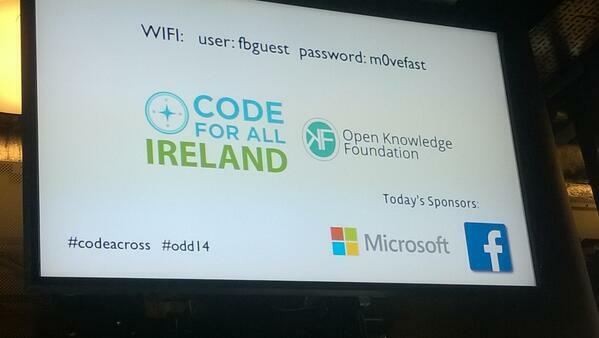 All great projects and we’re happy to have teamed up with Code for all Ireland. So that’s it – that’s what we did Saturday! It sounds a lot and it was a lot – we are really impressed with what was achieved!! Big thanks to everyone for doubling down for that one day of the year. So you teamed up with other groups to make this event happen? How do you organize an event like that? Yes, the event was co-organised by a number of civic minded volunteer, professional and civil society groups in Dublin highlighting that collaboration can lead to great events that bring communities together. Open Knowledge Foundation worked together with Open Data Ireland, Code for All Ireland, Open Data Science Ireland and Code for Dublin to build out the different project break-out sessions. The event was also kindly hosted and sponsored by Facebook Headquarters and Microsoft in Dublin – a huge thank you to them for making it happen. You are happy with the outcomes of the event? Yes, very. It was great to see everyone come together for that one day and collaborate, create and make something happen that is valuable to our society as a whole. It’s like people appreciate giving something back and we really appreciate that they take the time and put work into those type of civic projects that can help make a difference to our fellow citizens. Anything that would have made the event even better? Well, one of the things that we would like to see is an understanding on behalf of our government of this type of volunteer culture, hackathons, data days, civic working groups and interested citizens and how it can contribute in a meaningful way to improving services for citizens and to help address real issues that citizens care about. We would like to see a much closer relationship between the government and those groups to foster a sustainable model of citizen participation. We see this as something the government can explore as their next steps and so it would be nice to see representatives at some of our events in the future. This would enable us to talk through how government and citizens can improve services and requirements for open data together, learning from each other. But we are working on that, and we’ll keep inviting them! Ok, please do! Last question – who makes up the OKF Ireland team – in case we want to get involved in any of the projects you’ve been working on? Sure, no problem. Anyone who considers themselves an interested citizen we are interested to talk to and hear their opinion on what we are doing in the public eye. We particularly want to learn what our ordinary citizens think but also appreciate any insights or contributions from businesses, interest groups, subject matter experts, other organisations because we know citizen participation is limited and so we’d like to harness those views and use at the forums that we participate in. So our team is: Denis Parfenov, Flora Fleischer, Eugene Eichelberger, Salua Nassabay, Ingo Keck. All our contact details are on our Local OKFN Group Profile. Please feel free to contact anyone on any of the project mentioned. We are all open and share all our information! Thanks again and great Open Data Day 2014! © 2019 Open Knowledge Ireland. All Rights Reserved. Coller Theme by Rohit.